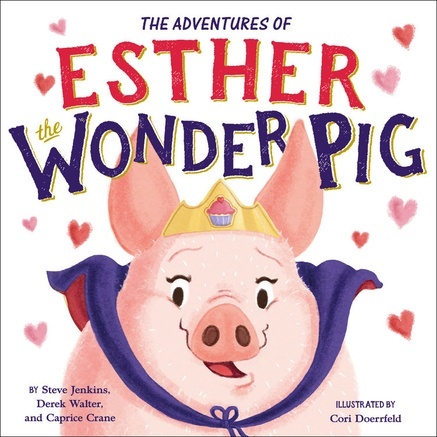 Hachette Book Group has finally revealed the cover of THE ADVENTURES OF ESTHER THE WONDER PIG by Steve Jenkins, Derek Walter, Caprice Crane and illustrated by Cori Doerrfeld! The true story of social media sensation Esther the Wonder Pig and her two dads that inspired the New York Times bestselling memoir for adults is now being told in a picture book with adorable illustrations and a message of love. When Steve and Derek adopted a mini pig named Esther, they had no idea that she would turn out to be not-so-mini after all. When her new family saw just how big and wonderful Esther really was, they fell in love--and their lives changed forever. Esther would soon grow too large for her bed, and their small apartment. She got into everything, including her neighbor's tasty garden. So the whole family moved from a small apartment to a big farm, where Esther and her animal friends could fit happily (and get into a little less mischief). Eventually, that farm would become the Happily Esther After animal sanctuary, home to rescued animals of all kinds. The grand finale to the New York Times bestselling series, Attack of the BULLIES stars Ruby Peet, aka Agent Pufferfish, the team captain with super nanobyte-enhanced allergies. Pufferfish leads the team in their latest case: the kidnapping of the president’s daughter. 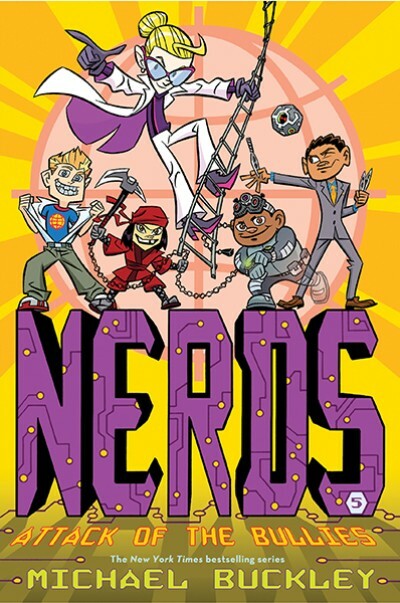 But the NERDS discover she hasn’t been kidnapped—she’s been recruited. Their former librarian, Ms. Holiday, has started a rival organization called BULLIES, who each have their own nanobyte-enhanced upgrades. The BULLIES’ plan: go back in time to make sure NERDS never existed! When Ruby’s teammates begin to vanish one by one, she enlists Agent Brand and Heathcliff Hodges to go back to the 1970s and help the original nerdy secret agents make sure that the future is not erased from existence! Attack of the BULLIES promises action, humor, and a dramatic conclusion to the series. K-Gr 2–Mr. Tiger lives in a perfectly fine world of prim and proper ladies and gentlemen. One day, the stiff suits, dainty teas, and Victorian manners begin to bore him… and he has a very wild idea. This “it's okay to be different” story stands out from other picture books on the topic thanks to Brown's delightfully clever illustrations and masterful compositions. From the tiger-striped cover that begs to be petted to the ingenious pops of bright orange (Brown's new signature color?) amid muted browns and grays, the award-winning illustrator does not disappoint. Children will appreciate Mr. Tiger's transformation and the way his friends eventually accept his (and their own) uniqueness. Several wordless spreads encourage audience participation while subtle visual clues gently build his character. A full spread featuring the newly liberated Mr. Tiger au naturel is delivered with pitch-perfect comedic timing and is guaranteed to inspire wild giggles. 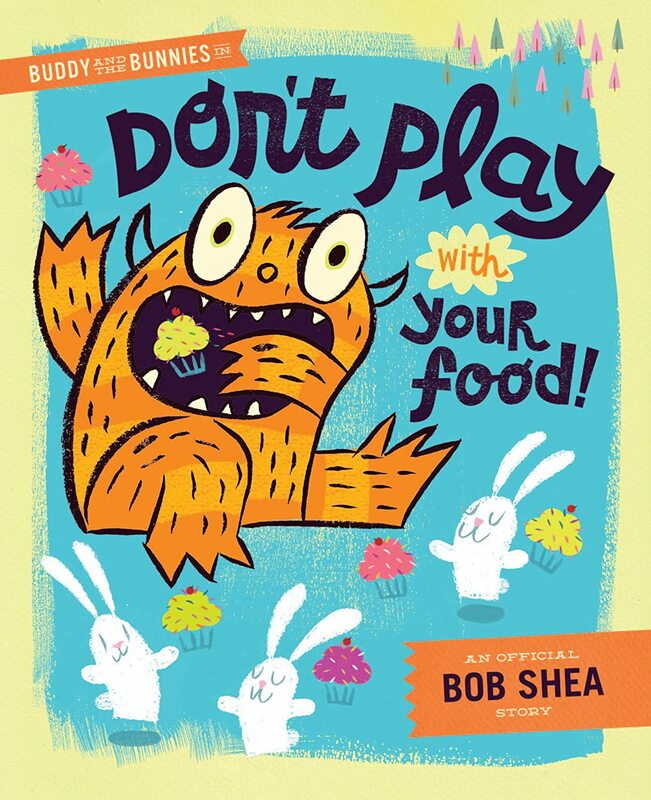 Sure to be an instant read-aloud classic in classrooms and libraries. As the Dead Kid Detective Agency embarks on its second (mis)adventure, October Schwartz and her five deadest friends are back, turning over metaphoric rocks and finding the centipedes underneath. In this latest volume, set against a backdrop of yuletide pandemonium, they discover dark supernatural forces at work in Sticksville and sleuth their way through a mystery involving a blizzard of suffragettes, ice skating disasters, anti-Asian sentiment, and the Titanic. Although the holiday season has descended upon the town like an eggnog rainstorm, October has no time for candy canes or mistletoe. She’s busy dealing with an oddly pleasant new history teacher, her two living friends’ new roles as high school radio DJs, and mysteries to be solved before the year end. October and her ghost friends are hot on the trail of those responsible for Morna MacIsaac’s death in 1914—or as hot as one can be on a 100-year-old trail—when Yumi becomes the target of a sinister harassment campaign at school. Solving dual concurrent mysteries at once won’t be easy, but the intrepid heroine in black eyeliner loves a challenge. All Rufus Leroy Williams III wants is to go to school so he can learn to read his favorite book. But there's one problem: he's a pig and Principal Lipid says: “NO PIGS IN SCHOOL!” Rufus even gets a backpack, a lunchbox, and a blanket to prove he's ready. But Mr. Lipid won't budge. Is there ANYTHING Rufus can do to change his mind? Kim Griswell and illustrator Valeri Gorbachev have created a love letter to reading that's also a charming, original, and child-friendly first-day-of-school story. TIME For Kids The NEW BIG Book of Why Crazy, Cool & Outrageous answers the questions that kids commonly ask and adults can rarely answer. Why are our eyes different colors? Why do we put candles on a birthday cake? Why do we high five our friends? Why do elephants have big ears? Packed with hundreds of new brain busting questions with easy to understand answers that made the first Big Book of Why a best seller. The book is divided by subject area - humans, animals, environment/nature, technology and space - and written in an upbeat manner, each answer is accompanied by either a photo or an illustration to show the reasons why. TIME For Kids The NEW BIG Book of Why Crazy, Cool & Outrageous is a must-have book to satisfy the most curious of kids. Kids will be desperate to shar what they've learned with their parents, teachers, and friends...and anyone else who will listen! Architecture According to Pigeons is a fun, lively introduction for children to world's most beautiful buildings. In this delightful book, Speck Lee Tailfeather reveals that he and his fellow pigeons are in fact great aficionados of architecture. Speck delivers his account of a journey around the globe, offering a "bird's eye view" of the Colosseum, the Taj Mahal, Golden Gate Bridge, the Sydney Opera House, the Eiffel Tower, Frank Lloyd Wright's Fallingwater, and dozens of other buildings to delight children and parents alike. 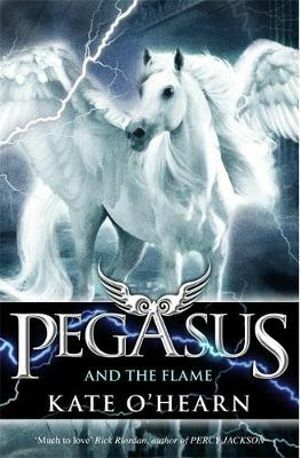 A must for fans of Percy Jackson! 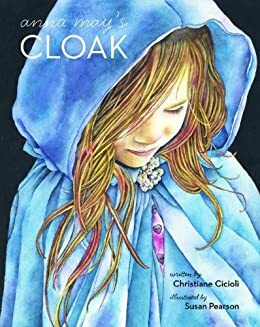 When Anna May is young, her grandmother makes her a beautiful blue cloak. When she wears it, Anna May feels like a queen. Soon the cloak is too small for her--but Anna May never forgets her favorite piece of clothing. Snip, snip, snip...see how Anna May's cloak is transformed as her family grows. A truly Canadian poem for young adults from two award-winning authors. The poem is about a lobster, Halifax Hal, who had always wanted to play a guitar. 2011 Trillium Book Award for Poetry winner, Nick Thran has authored two volumes of poetry. Illustrator Gabe Foreman, award-winning poet and visual artist, works in a Montreal soup kitchen. The Diary of a Wimpy Kid book 8 has a Canadian release date of NOVEMBER 5th, 2013! A few weeks ago Abrams Books released an original image by Jeff Kinney (seen here), which featured Greg Heffley under an umbrella being bombarded by raining eight balls. The image is a subtle hint of what fans can expect in the new book. "Never in my wildest dreams did I think that Greg Heffley's stories would be enjoyed by this many kids around the world," said Kinney in a statement. "I'm incredibly excited that ABRAMS is launching the newest Diary of a Wimpy Kid book with an international release of this size." The other books in the series include Diary of a Wimpy Kid, Diary of a Wimpy Kid: Rodrick Rules, Diary of a Wimpy Kid: The Last Straw, Diary of a Wimpy Kid: Dog Days, Diary of a Wimpy Kid: The Ugly Truth, Diary of a Wimpy Kid: Cabin Fever, and Diary of a Wimpy Kid: The Third Wheel. Jeff Kinney has also written and illustrated The Wimpy Kid Do-It-Yourself Book and The Wimpy Kid Movie Diary. First published in 2007, Diary of a Wimpy Kid has been widely praised for its ability to turn reluctant readers on to books. More than 85 million DWK books are in print in over 44 territories; three movies based on the series have grossed more than $250 million and The Wimpy Kid Island on poptropica.com, a virtual world for kids, remains one of the most visited on the site.